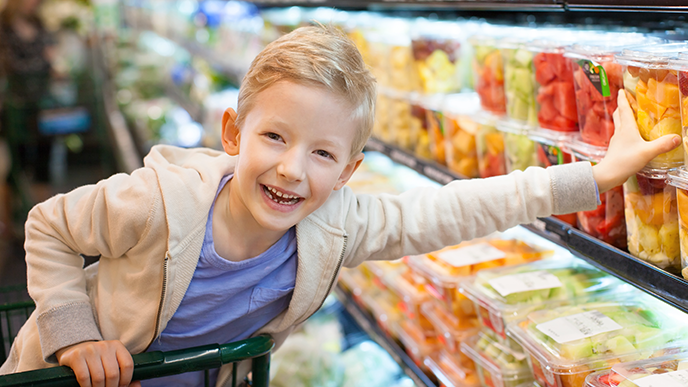 Grocery shopping with kids doesn't have to be a stressful experience. Everyday errands like running to the store usually become more complicated when kids are involved. Whether they’re making a fuss because they’re bored, or they just want to grab every product on the shelf, shopping for food with little ones can quickly turn into a nightmare. It’s easy (and tempting) to distract your kid with a smartphone and call it a day, but hold that thought. Fatherly shared a list of six grocery store games you can play with your kids to make the experience more enjoyable for everyone. One game, “Roaming Cash Register,” lets kids practice their math skills as they’re asked to keep a running total of the cost of the items going into the cart. Another game, Food Bingo, takes a bit more work. Before heading to the store, you can create a Bingo card using items from your shopping list or just those you know the store carries. Kids can cross off each one they see, or each one that makes its way into the basket. If you’ve got younger kids, you can easily adapt this game to their skill level by replacing brand names with things like colors or shapes. Parents, do you use games to keep your kids entertained while grocery shopping? We’d love to hear about them in the comments, or tweet us at @superparenthq.